Introducing the latest in home robotics, knifeRobot! Brought to you by HOTT, Inc. For only $9.95/month, you can have your very own in-home, internet connected and socially enabled robot. knifeRobot chops, cuts, slices and dices anything in the fridge. knifeRobot is easy to use and totally automated. You can even control knifeRobot from the web or your mobile phone – your dinner prep is done before you even get home! Never lose a finger again! HOTT Guarantees that you will be 170.3% satisfied with your new knifeRobot. Not only will you have no regrets about welcoming a new knifeRobot into your home, you will most likely feel that is one of the best decisions you have or will ever have made. Now let's have some sandwiches. 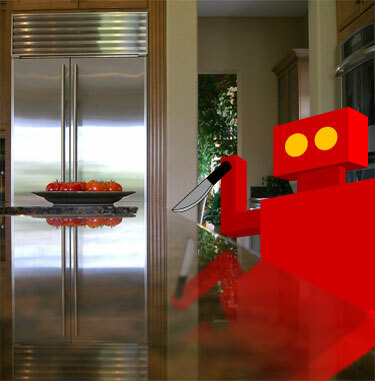 knifeRobot is an automated, web-enabled robot for the resedential or commerical kitchen. Our latest knifeRobot™ extension is the spoon. © Product Company, 2019. All rights reserved.